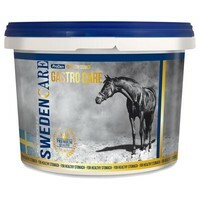 GastroCare for Horses is a scientifically formulated supplement to help neutralise acid and maintain normal stomach activity in horses. Containing soluble fibres (prebiotics) that absorb some of the excess acid produced by the stomach, the carefully balanced formula also contains Glutamine which helps to regenerate and promote growth of the stomach lining. GastroCare helps balance the troublesome gastric effects of feeding practices that incorporate low volume high grain diets.